Bring out the charm of ethnicity with Pick Any One Georgette Saree with Border by Pakhi (AGS1), a must-have addition to your saree collection. Made from georgette fabric, they are lightweight, easy to drape and comfortable to wear all day long. The sarees are embellished with either geometric or bandhej prints. Vibrant and appealing, this saree measures 6m and comes with a 70cm blouse piece, sufficient enough to try various styles and designs. 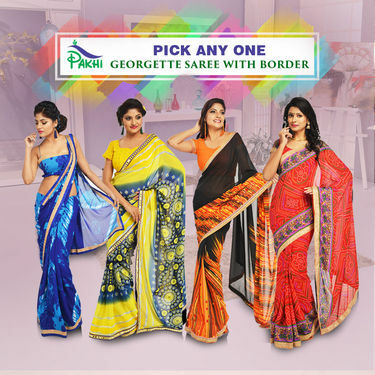 Versatile & charming, Pick Any One Georgette Saree with Border by Pakhi (AGS1) is a perfect pick that will suit your taste and style. The traditional colors and running prints in the combo is a must-have addition to your existing saree collection. Designs/Prints: The collection is an ode to geometric or bandhej prints that look ravishing overall. The colours are rich and vibrant, thus are suitable for all types of skin tones. Style Tip: Wear this Georgette saree with complimenting blouse and ethnic jewellery to make it a perfect wear for the evening parties or casual wear. If you are looking for fashionable and trendy sarees, then opting Pick Any One Georgette Saree with Border by Pakhi (AGS1) is best to go. Ideal for gifting purposes too. Pick Any One Georgette Saree with..VSPack of 7 Gold Border Sarees by P.. Pick Any One Georgette Saree with.. VS Pack of 7 Gold Border Sarees by P.. Pick Any One Georgette Saree with..VSPack of 9 Printed Georgette Saree.. Pick Any One Georgette Saree with.. VS Pack of 9 Printed Georgette Saree.. Pick Any One Georgette Saree with..VSSoumya Collection of 9 Georgette .. Pick Any One Georgette Saree with.. VS Soumya Collection of 9 Georgette .. Pick Any One Georgette Saree with..VSKanjeevaram Art Silk Saree - Pick.. Pick Any One Georgette Saree with.. VS Kanjeevaram Art Silk Saree - Pick..